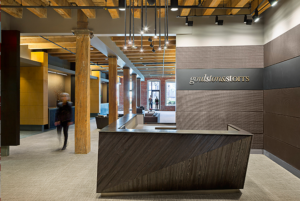 Holm & Associates was hired by goulston&storrs to act as their move manager and assist with coordinating renovations to their Atlantic Avenue location in Boston, MA. Our role was to develop a logistics / phasing plan and manage the re-paint and carpet of 6 fully occupied floors, as well as renovations to their Cafe, Conference Rooms, Law Library and Common Areas. The Following year our team was re-engaged to assist a with similar project at their Rowes Wharf location.